Although the pharmaceutical industry is dragging its feet implementing RFID (Radio Frequency Identification) technology to keep track of drug supplies, some companies are currently using the technology to track physicians' movements at scientific conferences. "Dr. Wes" (Westby G. Fisher, MD, FACC) called this "Physician Tag and Release" (see "The Implications of Physician Tag and Release"). The photo on the left shows the back of Dr. Wes's badge at the recent American College of Cardiology Conference held 2-5 April 2011 in New Orleans, LA. The technology is also being used at the Heart Rhythm Society conference going on right now. Propublica and USA Today co-published a story about how doctors are being bombarded with pitches for drugs and medical devices at this conference (see "Financial Ties Bind Medical Societies To Drug and Device Makers"). RFID tracking is a disturbing aspect of industry-sponsorship because it may give exhibitors access to the identity of any physician who enters (or merely passes by?) 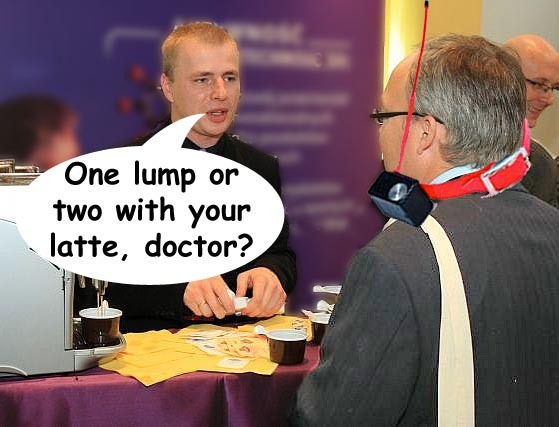 sponsor booths at medical meetings even if the docs do not talk to reps or give their permission to collect such information. "Many physicians were unaware that exhibitors had paid to receive real-time data about who visited their booths, including names, job titles and how much time they spent," says Propublica. "The second way in which RFID technology is utilized is in the Exposition. 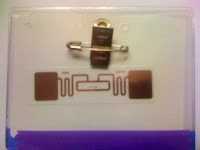 Exhibitors were able to rent RFID readers from the vendor. They are able to use the data in much the same way as the ACC – to evaluate how effectively their work stations are structured and to improve their offerings to attendees. In addition, they are given access to limited information about the visitors to their booths. The information they are given is the same information that was available on meeting attendees badges in print (name/city/state/institution). No contact information is provided. ACC’s intention was not to create a revenue source by offering attendee data to exhibitors (in fact, only five out of more than 300 exhibiting companies decided to invest in RFID in their booths), but rather to provide exhibitors another resource by which to understand the traffic flow in their booths and to better align their displays with attendees’ needs." Instead of "opting in" for tracking at scientific meetings, doctors must "opt out" from the use of tracking technology when registering for scientific meetings. "It is no secret that these societies make a significant portion of their operating revenues from industry sponsors at these meetings. By instituting tracking, the value of their membership's privacy has taken a back seat to the income generated from tracking revenues." "At the risk of sounding like a conspiracy theorist, it is not too hard to imagine one's credentials being called into question in court because a doctor did not demonstrate enough time in CME activities at the scientific sessions to quality for credit or because these data implicate a doctor in a purchasing agreement between a vendor and hospital system simply because a doctor visited a display booth." Dr. Wes also imagines a scenario where RFID data collected at medical meetings can be combined with a doctor's prescribing information without their permission. That's a double whammy for physicians who wish to keep their prescribing habits private. The Supreme Court is deliberating that issue (see "Supreme Court to Decide Fate of State Laws that Prohibit Use of Rx Records by Pharma").